Social shares on Facebook and Twitter closely correlate with how a site ranks in Google searches, according to a new study by Searchmetrics. Facebook activity appears to have the highest impact on rankings, with a Facebook share the most important factor. Twitter is far behind these values but is still the sixth strongest metric behind Facebook and the number of backlinks. The full range of factors tested in the report can be seen in this graph, with social metrics clearly having a major impact. The study found that Google+ has a correlation of 0.37 with search rankings, which would make it the factor with the strongest correlation. However, Searchmetrics CTO and founder Marcus Tober said this statistic needs to be treated with caution. Google+ does not currently have enough users for us to be totally confident about this finding. But it’s indisputable that Google is trying to make Google+ an important player in most things it now does. So search and digital marketers should be sure to keep an eye on further developments. In our December Quarterly Digital Intelligence Briefing, we found that only 25% of company marketers currently regard social signals as ‘very important’ for determining search rankings. Tellingly, when asked how important they would be in three years’ time, the percentage increased to 57%. Back in January Google announced that it would be penalising sites that display too many ads at the top of the page, and the new report suggests that this even applies to Google’s own ad products. All advertisement factors returned a negative correlation, however “general AdLinks (common integrations e.g. Commission Junction, AdSense and others) are slightly less negative than the use of AdSense alone”. When Searchmetrics looked at the percentage trend for AdSense integration and all other analysed competitor networks according to rankings, it found that AdSense advertisements drop sharply among the top rankings. But as other ads remained consistent, it suggests that only AdSense has a negative correlation. Therefore, at the moment it seems that we are more likely to find sites with fewer traditional advertisement integrations in top rankings. Of course, this might also have something to do with brand sites. Sony, for instance, has no banner ads on product pages. While SEO is portrayed as a level playing field, Searchmetrics’ report suggests that the rules don’t apply to major brands. Factors commonly believed to boost rankings, such as the quantity of text on a web page and having keywords in headlines and titles, seem less important for well-known brands. This graph suggests that the less often a keyword appears in the headline or title, the better a page will rank. Furthermore, text quantity seems to have no real positive effect. This may come as a surprise at first, but if you look at the metrics for the to 30 places a pattern emerges. Right up to the top 10 results, the factors behave as expected without any large correlation in any direction. However, in first place, the natural niche for brands, everything is turned upside down. This graph shows an index value for the frequency of the assessed ranking factors on the y-axis, and Google rankings appear on the x-axis. The pages with the lowest figures appear in the top three positions. From this we can take it that to end up in the top positions you do not need a keyword in the title or in the H1 headline and even the average word count tends to drop off towards the top results. Strong brands rank in the top five even without perfectly conforming on-page structures, and the effect occurs throughout the whole analysed keyword set, not just for brand and brand combinations keywords. While the report suggests that social is becoming the most important factor in search rankings, backlinks continue to be critical for SEO. And it’s about quality as well as quantity, i.e. how many friends have you got and how good looking are they? These figures indicate that the proportion of nofollow links correlated with rankings only slightly less strongly than the proportion of links containing keywords. Even the proportion of links containing a stop word can have an effect. As such, a more natural link structure may be necessary for boosting search rankings, rather than “a large number of perfectly optimised links that include all the keywords it wants to rank for in the anchor text. Keyword domains correlate much better with high rankings than results from just any random start page. The correlation with keyword domains is much higher than the correlations for keywords in the rest of the URL. Although Google has repeatedly emphasised that these sites will slowly weaken in power, this does not yet seem to be the case. 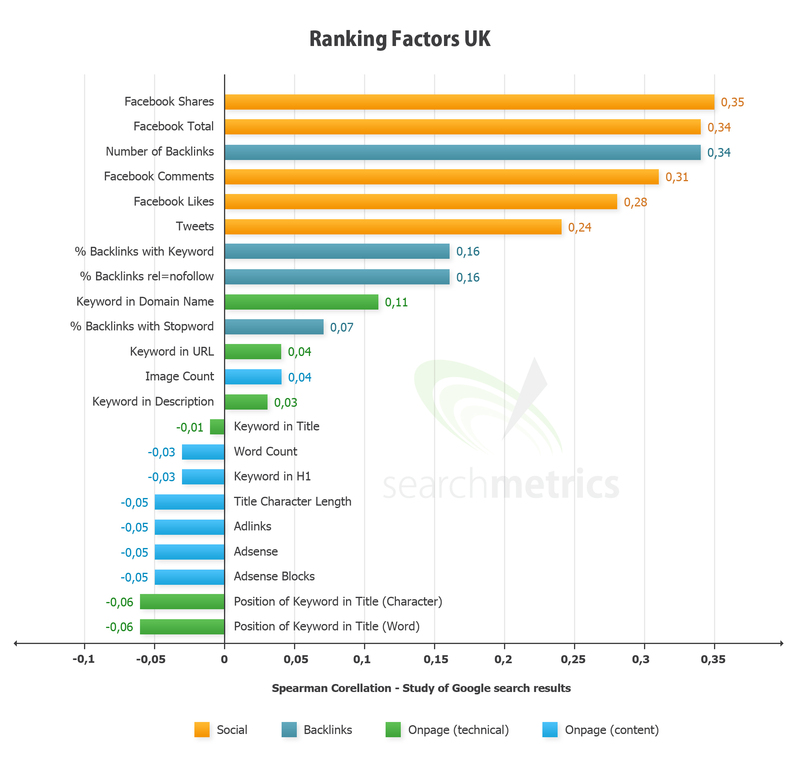 Searchmetrics is quick to emphasise that while there is a correlation between certain factors and high rankings, there is no guarantee that this amounts to causation. Questions like ‘does a site receive social signals because it ranks well or does it rank well because it receives social signals?’ are absolutely valid and cannot be answered unequivocally with the current data. Even so, a relationship clearly exists between the two and needs to be taken into account when developing an SEO strategy. The report is based on analysis of 10,000 search terms, leading to 30,000 SERPS and 300,000 titles, descriptions and URLs. However, the search terms used contained a disproportionately high number of brand keywords which might have distorted the assessment of many other key factors. Most SEOs seem to agree that Google will increasingly use social signals, though there is some debate over the extent to which this is happening already. Also, how Google will incorporate social shares is unclear. Kevin Gibbons recently looked into how Google+ has been impacting search, but found that it actually decreased click through rates in some of the examples he looked at. A strong social footprint is likely to make your rankings more defensible and future proof to algorithm updates. So rather than thinking about the next quick fix or latest SEO or link building tactic, make content marketing the centre of your SEO strategy instead! Thanks to the rise of social media, there’s a mad race to measure influence and help brands harness it to their advantage. That has created an ecosystem of companies vying to prove that they can most accurately identify the social media users with the most clout. One of the most prominent players in the space, Klout, is also one of the most controversial. A new report into the efficacy of banner ads claims to dispel myths about low CTRs and conversions. ComScore found that a small subset of people, less than 10% of all internet browsers, were responsible for more than 80% of all clicks. It concluded that those who click on banner ads tend to be younger and with low income, so were “hardly an attractive target segment for most advertisers”. Criteo disputes these findings, claiming that people who click ads are more likely to make a purchase, and the more ads a user clicks on the more products they will buy. When Colorado politicians pushed an affiliate tax designed to bolster their state’s revenue on the back of out-of-state retailers, one thing was certain: the effort would backfire. After all, we’ve known for years that states which have tried to find a way to collect sales tax on out-of-state internet sales fail to raise revenue.